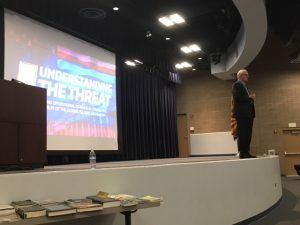 Over 100 law enforcement officers from all over Arizona as well as a few other states attended UTT’s “Understanding and Investigating the Jihadi Network” course at the Mesa Police Department hosted by the Arizona Police Officers’ Association last week (May 16-18), and received a heavy dose of reality about the threats facing the United States from the Global Islamic Movement and the hard-left Marxist/socialist Movement. 100% of those present stated: (1) they did not know the information presented about the Muslim Brotherhood’s jihadi network in the United States nor about sharia; (3) they did not know about the hard-left Marxist/socialist movement and how it works together with the jihadis; and (3) they all believe the information is critical to protecting their communities. There was an unusual amount of pressure on the interim Police Chief at the Mesa Police Department to shut UTT’s training program down. 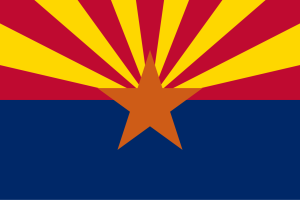 Local TV news, print, and online media outlets, as well as the American Civil Liberties Union (ACLU), the Southern Poverty Law Center (SPLC), the Anti-Defamation League (ADL), and the terrorist group Hamas – doing business as the Council on American Islamic Relations (CAIR) – all brought pressure on Arizona officials to cancel the UTT training. Members of Congress even called the Chief’s office. Yet, the Chief stood firm and courageously allowed the training to take place. On Day-3 of the program, UTT was joined by former founding member of DHS Philip Haney, the author of See Something Say Nothing, who shared his own story of how he was ordered by DHS leaders to remove hundreds of names of individuals and organizations directly tied to terrorism out of DHS databases, and then punished for doing investigations into them in the first place. His testimony had a significant impact on the students who realized the depth of the problem inside the federal government is much worse than they were previously aware. To hear these comments for yourselves, please listen to the Understanding the Threat Radio Broadcast at www.WorldviewRadio.com (John Guandolo) or go directly to the link HERE and listen from the 8:08 to the 11:31 marks. These comments and the overall battle in Arizona reveal several key things: (1) UTT is the only organization in America giving law enforcement tools to proactively locate terrorists (jihadis) in their areas; (2) UTT is the only organization in America teaching law enforcement to map out the terrorist (jihadi) network in their areas; and (3) UTT is the only organization in America working with state and local leaders to create innovative strategies to dismantle the jihadi networks. This victory in Arizona is measurable and noteworthy in that UTT provided truth about real threats from the Global Islamic Movement and the hard-left marxist movement inside the United States despite heavy resistance. The battle is yet flagrant and we have a lot of hard work to do to achieve real and total victory. Push this article out to as many people as possible. Share it with your law enforcement leaders in your community as well as the National Sheriff’s Association letter and Executive letter supporting UTT and its work (available upon request). Stand behind your law enforcement officials to bring this training to your town. Learn this material for yourself. Use UTT’s resources and training programs to deepen your understanding of the threat at the ground level. Speak the truth boldly about this threat. Know the enemy, know our founding principles. Can somebody please explain what “islamist” means – as compared to “islamic” And why are the terms “radical” and extremism used? Isn’t it just Islam itself that produces the terror? I’m going to go out on a limb, I’m not an expert, I’m a Christian who is sober and on the alert. I’ve watched as the country that I have been born in, the USA elected a Muslim Islamist president. A president who provided cover to the terrorists, and gave them aid and comfort in a time of war. Terrorists attacks on US citizens were down played as “work place violence”. I could go a lot deeper in the case for treason against the United States of America by the former president and his relationship to Iran, The Muslim Brotherhood, Turkey, etc..
From my understanding (or lack there of), an Islamist is a Muslim who believes in sharia law as being supreme to all other forms of government and they are seeking to subvert and convert the entire world to Islam. The terms radical and extremism are terms that Islamic sympathizers (wolves in sheep’s clothing) use to “brain wash” and deceive westerners to think that Islamic terrorism is not the norm, when it is in fact the end game of the false religion and false god of Islam. You are right to say that Islam itself produces terror because it is based on a demonic religion that produces death. I’m sure that someone who is an expert can really explain it much better than I can, I just know that it is evil. Furthermore, given the identity of the individual recently gifted with control of yet another diversionary political investigation stemming from fake news involving the Russians, the actual objective of said farce was probably to dust-off the reputation he has of being a prime participant in the treasonous 9/11 cover-up, which points to the probability that the reverence of the American people he once had is beginning to wobble; lets hope so! In the meantime its important not to underestimate the contextual relevance of section-3 of the Constitution’s 14th Amendment. Too, respecting further “diversion”: inasmuch as the term “tweak” appears on page 23, para-3 of an evidentiary document seized by the FBI entitled “An Explanatory Memorandum On The General Strategic Goal For The Group In North America”*(I.e. the twenty-nine battalions of sharia-adherent Muslim Brotherhood killers, many of whom have been enabled by U.S. government quislings to swap Middle-East millions for federal law-enforcement and (critical) aeronautical positions, to my knowledge is rarely, if ever, used in the United States except by American pilots with respect to fine-tuning the position of control surfaces of an aircraft in flight, I.e. ailerons, rudder, elevator etcetera, and “tweaking” avionics etcetera. Thus, given that said “Explanatory Memorandum” was written in 1991, and even then referred to Muslim Brotherhood ownership in America of a comprehensive media and art organization, an audio and visual center and an art production office, perhaps the sophisticated visual clips being created essentially for the purpose of scaring the hell out of non-Muslims worldwide – which with respect to the pose, the laundered clothing, the demeanor of the actor, the background and what appear to be even recently cosmolined weapons, they’re to slick to believe, thus perhaps should be stamped MADE IN THE USA.